The project by Dimensi-on has banked on the solid surface to finish the restyling of the premises. The beauty clinic wanted to bring innovation and tradition together with high quality elements. The restyling of the Maribel Yébenes Institute of Medicine was overseen by the Dimensi-on interior architecture studio and installed by VF Solid Surfaces, which wanted to create a unique space. In the building’s framework, which is a listed building in Malaga, there is a beauty clinic which is one of the most renowned in Spain. The aim of the restyling was to design a modern space which would respect Andalusian traditions, as well as providing a feeling of comfort without losing that all important sophisticated essence which appears in Maribel Yébenes’ central offices in Madrid, Havana and Miami. 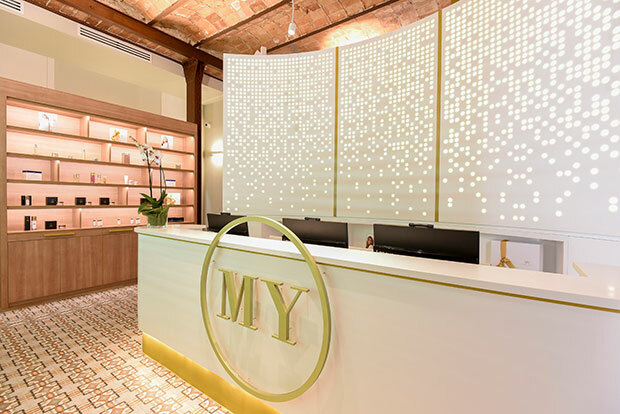 Choosing KRIONTM meets the aesthetic, antibacterial and durability requirements, which are a must-have for a clinic like the Maribel Yébenes’. The presence of the Solid Surface is felt in the entrance area. Behind the counter, a vertical column in the shape of a backlit half-moon covered with the material contrasts with the brick walls and iron beams. The healthiest development by KrionTM has been used in the bathrooms. Like so, the thermocurvable basins are made with KRIONTM K-Life. An Eco Active material which improves the air quality of the space, and at the same time, it maintains the technical qualities of the solid surface pure white tone. The coming together of styles in an image change which is captured, thanks to the choice of KRIONTM, a material which reveals exclusivity and high resistance.